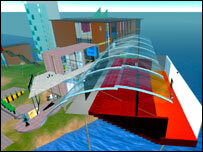 A university is holding an open day in the virtual world of Second Life. BA Media students at Liverpool Hope University have set up a virtual campus on the imaginary world website as part of a six-month project. Virtual students will be on campus on Thursday to interact with prospective students from across the globe. 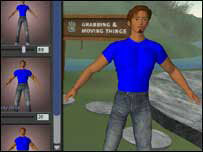 Second Life is a virtual world operated via a downloadable internet programme that enables its users, or "residents", to interact with each other. There are more than 20 million residents registered. Visitors who log on to will be able to explore buildings, some of which do not exist in the real-life Hope, and find out more about the history of the university. The students working on the project have reproduced buildings such as the Sheppard-Warlock Library and the Gateway Building. They have also added their own twists, such as creating their ideal student accommodation and film studio. Dr Charlie Blake, head of media, film and communications at the university said: "The Open Day will be an innovative and exciting interactive experience for our visitors. "Student Ambassadors have already created their own virtual characters that will be on hand throughout the day to talk to prospective students and offer them advice about studying at Liverpool Hope University. "As the virtual campus is a mix of real and fictional buildings, visitors will be introduced to some of the well-known sights around campus, while the more imaginative ones will create talking points to encourage conversations between current and prospective students." The university's marketing director, John McCarthy, added: "The aim of the virtual campus is to engage in a dialogue with students in a forum that they will not only enjoy, but will also provide them with opportunities for creativity. "Whilst some of our University buildings are faithfully reproduced, others have been built that reflect our students' ambitions and aspirations, where else can you find a student hall with a swimming pool!" A more traditional open day is to be held at the university in June.